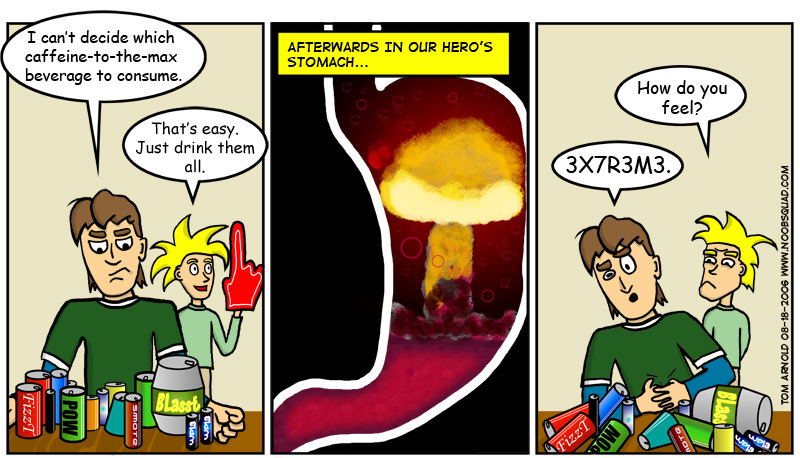 n00b squad - "l33t Caffeine"
Co-creative credits go out to the Big Jeff on this comic, an influence we haven't seen around since the second coming of the lady vampire. With the massive arsenal of caffeine available at one’s disposal, it’s hard to choose these days. Normally I stick with the classic red cola machine and avoid the likes of drinks named after men’s testicles, bulls or man-bull’s testicles. When desperate times call for desperate measures, there’s always the towering can of Jolt that decompresses the room when opened. Like every other Xbox 360 owner on the planet, I’ve been playing Dead Rising. Like how Soul Calibur always surprises with a never seen before move, Dead Rising surprises with a never seen before weapon. The zombie wailing guitar has been the latest to amuse me with the Mega-Man Mega Buster before that. Capcom’s finally capitalizing on their intellectual property of lore a la Nintendo. I’ll be heading out to the Penny-Arcade Expo next weekend. Nintendo’s going to be there, hopefully complete with playable Wiis. I thoroughly expect a packed exhibition hall if that is the case.